The stability of the wing is revisited in this work, the natural modes of the thin wing in incidence under the action of aerodynamic forces are calculated. The wing in this study has two degrees of freedom corresponding to the bending and torsion. Boundary between stable and unstable zone are calculated. 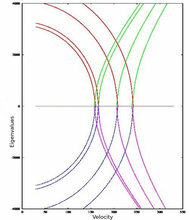 Wing stabilization by piezoelectric material are considered. The noise level produced by unsteady impinging gust is predicted.